Looks nice, probably costly though and LED isn't something I'm personally a huge fan of but it's been increasing in popularity so for a enthusiast case like this I guess it's not surprising to see it getting LED'ed out a bit. 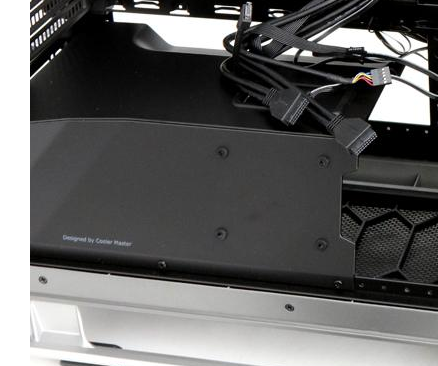 They're bulky and heavy though, that can be a major drawback for several users considering their next chassis but it is pretty roomy as a result, will be interesting to read more on the review for things like cooling and sound dampening. EDIT: Ah so HDD storage is affected a bit on this model, interesting. Not a patch on the Temjin Tj07. Really like this case but the price!!!!! I could get a much more attractive Lian Li for the same cost. In my opinion it would have looked much better and be quieter if they had a bezel on the top much like what is on the front. I had the cosmos 2 and lugging that around up/down 2 flights of stairs was fun. I like these case reviews, in as much as you can see all the details of the case, but cooling performance would be by number one priority when choosing a new case - perhaps it would be good if these reviews contained CPU/GPU temperatures and maybe even air temperatures inside the case in different places measured with thermocouples. I know from messing around with fan configurations on my own case that there is a large scope for differences in temperatures, would be really cool to see some numbers to help make decisions between cases - unfortunately it's nowhere near as simple as stick on more case fans to make it cooler, so you can't really tell cooling performance of a case by just 'looking at it' in reviews. It's the one thing I should have considered more when building my current PC - next time I'm gonna research PC cases as much as humanly possible for my next build! Looks pretty cool. Would preferred double sided glass perhaps. Actually that is mentioned like 3x in the review, and even is mention under the photo you highlight? I hear you, but next to being horrendously time intensive, I find temp measurements incredibly subjective as each PC differs ergo all thermals will always be different. You also have to weigh in that your motherboard will regulate a CPU cooler towards a certain delta, ergo subjective info. It's the same with most GPUs that have a thermal threshold, e.g. 80 degrees that they will abide. Not one PC is the same and the sum of all parts will dictate the temps, not a chassis all by itself. I always get a nostalgic feeling when looking at a Cosmos case. Feels like they've been around forever, but while I like big, this was and still is a bit TOO BIG even for me. Yeah, I agree that the parts chosen will affect how well a certain case performs in it's abilities to cool the components - things like length&style of GPU, type of CPU cooler used & size, both of those things obstruct and/or change the airflow in a case which might make one case perform better over another depending on configuration chosen, so I can see where you're coming from. It would be too time consuming to test different configurations of CPU cooler & GPU size/style, but settling on the most 'common' type of configuration as a base for testing all cases would be easier & provide some basis of comparison. I'm guessing you'd keep CPU fans and GPU fans at a chosen manual constant value to ensure more valid comparisons between CPU/GPU temperatures. I can imagine I'll just find it difficult to choose a case in the future if I haven't got numbers to base it on, I'm not sure how I'd choose the right one when I know it can make a hell of difference to CPU & GPU temperatures. Very nice looking. I am not personally into the RGB craze right now, a smaller version of this would be amazing. Will wait and see. Like a wise man around here says on every post. Exactly, its like when people quote components temps but not mention the room or case temperature.